Peters, D., Hamideh, S., Zarecor, K., Ghandour, M. “Using Entrepreneurial Social Infrastructure to Understand Smart Shrinkage in Small Towns,” Journal of Rural Studies, vol. 64 (November 2018): 39-49. Kimberly Zarecor et. al. A Data-Driven Framework for Smart Decision-Making in Small and Shrinking Communities. Presented at the ‘Smart, Local, Resilient’: Enabling Our Communities through Research Partnerships’ Meeting. Grand Forks, ND, July 17-18, 2018. Ahmed Elsherif, Hannah Fisher, James Weatherly, Matthew Lechowicz. 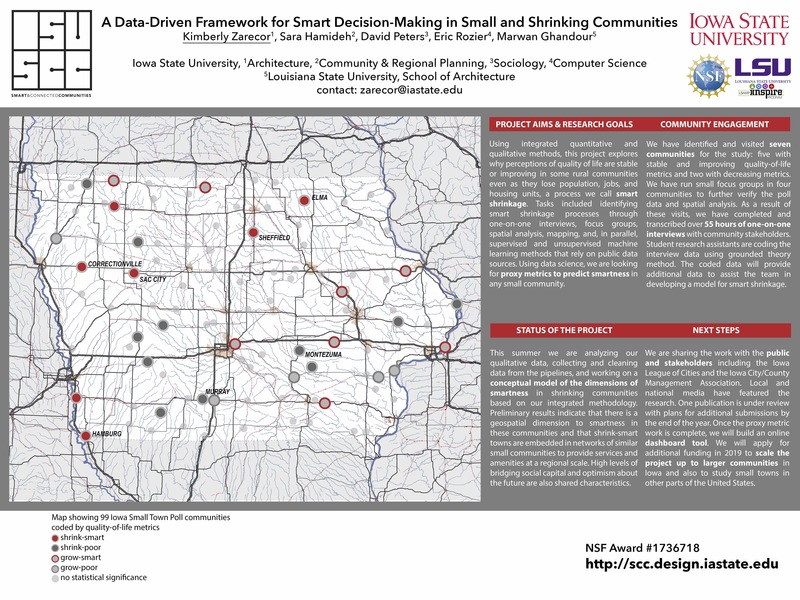 A Data-Driven Framework for Smart Decision-Making in Small and Shrinking Communities. Midwest Big Data Hub All-Hands Meeting Poster Session. Omaha, NE, Oct. 2-3, 2017. This material is based upon work supported by the National Science Foundation under Grant Number #1736718. Any opinions, findings, and conclusions or recommendations expressed in this material are those of the author(s) and do not necessarily reflect the views of the National Science Foundation.